I love the internet (despite this country's intermittent signal); especially the invention of Yahoo, Google, Facebook and Instagram. My marriage with the Army guy is thriving lovingly because of unlimited texts and calls. The little girl knew a lot of her now favorite things because of the awesome technology that's already existing when she was born. She first saw My Little Pony on YouTube. She knows my online friends adore her antics that I post on social media. But I have an argument to raise... indulge me. If you have a hundred friends on Facebook and it's your birthday tomorrow, most likely half of them will greet you. And half of the greeters do not even talk to you in person, haha. Thanks to notifications! You will instantly know if a person doesn't like you if she just "seenzones" you after greeting her a lengthy, heartfelt message on Facebook Messenger or Viber even if she's online 24/7. That's the digital world, you all! It has its ups and downs, we all know that. Let's admit it - it lost the simplicity and excitement of someone greeting you on your special day because of how it works. As a 2000s parent, I realized that my 6-year-old will never experience snail mailing if I won't introduce it to her. So one day, I planned a snail mail revival when I remembered that my favorite twins (my paternal cousins living in the US) in the world would be celebrating their birthday. I got my modish Craftsmith postcards from The Blissful Box, which I mentioned on my Blissmakerie post and scribbled a bit of something for V&V. Then I asked my girl to make her own. I gave her plain white cardboards and scrapbook trinkets. 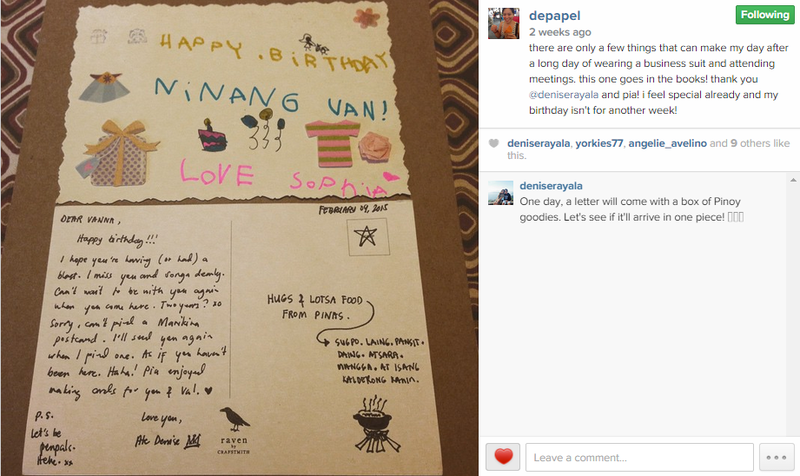 She had fun doodling and putting her personality on her DIYed postcard. The next day was funner (please don't tell my English teachers I used that word). We went to the Central Post Office after school! I made her line up because I'll take her photo for posterity, haha. She obliged, she loves doing grown-up stuff. She then had the letters weighed and the woman behind the mirror assessed how much we had to pay for each parcel. The other mail costed more since it's heavier (must be the butterfly trinket). When she got hold of the stamps, she was giggling and was kind of doing a little dance! My mommy heart was giggling, too but of course I can only manage to bite my lower lip. I was pretending like everything was normal, though the emptiness of its facade didn't look like it at all. It's sad to see that it wasn't how it was before. I thought of the employees who lost their jobs along the way because no one's using the post office's service anymore! Anyway. We were told to proceed to another window. The girl who checked our mails really didn't do anything but asked us if it's "express" or regular. I wonder why they have the express option. It's not gonna be snail mail anymore if I chose that, right? Or have I wanted to expedite the process then I can just go to LBC or have other couriers pick it up here at home, right? Oh well, just brainfarts. When the girl handed our letters back to us, I told Sophia to say goodbye to it 'cause it'll be flying to California once she slides it into the hole. She didn't. She kissed them! Hahaha! It was the cutest thing. I mentally pinned a note that we'll be sending letters to our friends and family abroad more often. If getting emails in the late 90s was the bomb, today, it's getting snail mails! Two weeks after, my cousins got it. In fact, days before their birthday. I didn't expect that it's gonna be that quick! I'm so glad that they liked it and it made their day. Nice. I did snail mailed my friend in Thailand last year too. I enjoyed it. it felt weird writing to someone with pen and paper though... Brought me back to highschool days. Haha.